2. What is the format for the RAGE Street Fighter V All★Star League powered by Capcom? 3. What are the teams? 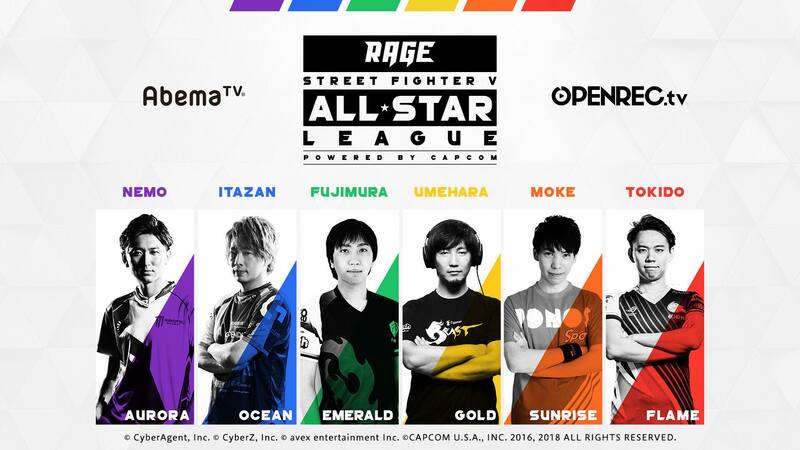 RAGE is running an "All Star" League for Street Fighter V in Japan this year. This post will talk a bit about what RAGE is, provide information in English about the event, and include links to streams. I'll keep the post updated with new information as I see it. Many of the source links will be in Japanese, but I'll note when there is an English link. RAGE runs tournaments for multiple titles, and in the past has done a lot with mobile game titles and card games. They've run some fighting game titles in the past, and in June will run their 2018 RAGE Summer tournament in Makuhari Messe featuring Shadowverse, read time card battle game Servant of Thrones, and Nintendo Switch's Smash Brothers. I've seen some of their previous tournaments, and they have high production values with large (for Japan) prize pools now that the eSports professional licensing system has been established. 2 What is the format for the RAGE Street Fighter V All★Star League powered by Capcom? Total prize pool is ten million yen, about $91,400 USD. No word on how that is allocated. They are taking the top 6 Japanese competitors from the 2017 Capcom cup as a leader of each team. Six total teams, 30 total matches (round robin, each team plays the other teams). The team draft will be streamed. Each team is 3 people, for a total of 18 people in the league. For the draft, each team leader will take a turn in order to specify one person that they want. The PR does not say who the potential candidates are, or what the order of the team leaders is. If there is a tie in who the team leaders want, the team will be decided by drawing lots. The league play will start on June 5th, streamed on Openrec and Abema. The actual play will use the Team Battle mode with 3 members, 3 rounds and 99 seconds, nothing carries over, order change is on. A set is first to three team battles. Winner of the team battle is the team that gets the most wins in the set of player 1 vs player 1, player 2 vs player 2, and player 3 vs player 3. They will also track the number of rounds won and lost as a tie-breaker. Each set is a Team Battle mode with three players on a team. The team that gets two wins in the Battle mode wins a star ★. All three matches are always played because the number of player wins within a match contributes to the Battle Points, which is used to rank teams with the same record. The game is a first to three stars race. So at most there can be five sets, at the other end a team can get a sweep and win in three sets. How will the teams play? They will play first to three stars, where a team gets a star when they win two of the three games in the team match. So essentially, first to three wins in the three player team battle. 3 What are the teams? The teams will be decided through a draft. I think this is interesting and fun, and I'm definitely going to watch it and write up my impressions here. Since the team captains are known in advance, you might want to strategically choose players based on the known match-ups at the time of the draft. As the draft goes deeper (there will one round to choose the first player on each team, then another round for the second player by my interpretation of the information I've seen so far) you will know more about the composition of the teams that you will face and that may change your strategy for whom you want to pick. I'm very curious to see who will be in the pool of players that can be chosen. I see that Fudoh's Fujimura is there, which is interesting. Fudoh is a team that is sponsored by Shinobism, which is Momochi and Chocolanka's company. Momochi has taken a strong stance against the Pro licensing system in Japan, saying that it basically does not honor FGC roots, and CyberAgent is more aligned with the Pro sports licensing system, so I'd be surprised if Momochi is invited. It isn't out of the question though, so I'm interested to see the full field. The draft will take place May 31st, Thursday night from 8pm JST (although the initial press release said 7pm) and will be streamed (see table below). Host: Tsuji Yoshinari, a freelance announcer who has done work on TV and radio. Host: Ayako Hatta, a model. Analyst: Jun Utahiroba, the bassist for the Golden Bomber visual key "air" rock band, and also an Ultra Diamond (I think) Ken. A funny guy, really is into street fighter, and friendly to boot. Analyst: Nanai. A SFV Bison player that is heavily involved in running the weekly Wednesday night SFV tournament at Akihabara eSports Square and has been doing a lot more commentary lately. Also an all-around good guy. Analyst: Yamato, a caster who comments SFV and also involved in the OreRevo series of fighting game (primarily online) tournaments in Japan. I was excited for the draft, and was glad that I was able to watch it. I had to get my six year old son in bed, but we did start watching together. When Nemo came on screen, he said "I want Nemo to win" – he played Nemo once at Tokyo Game Show 2017 and has been a fan since then. Moke was overseas, so submitted his choices ahead of time. The production values were high, and they had a nice set themed with the colors of the teams. In fact, each Captain had a pen in their team color, and a straw in their team color for their drink. They had nice interviews with the captains after their decisions were made, or when they lost in the lottery for players that were picked by multiple people. The Captains had a plan for their team - Daigo and Tokido both mentioned they specifically were looking at team composition not just in terms of player strength but how well they would get together as a team, which was interesting. Nemo took the opposite approach and talked a bit about how he chose Storm Kubo who plays a character he really hates. In a later interview he said something like he wants to be up-front with his teammates about who he likes or doesn't like, but I can never tell with him whether he is joking or not. HiFight tweeted a bunch of stuff during the draft, so check out his timeline for some highlights. Aurora Nemo Kazunoko Storm Kubo Lost out on Momochi in the first round. Ocean Itabashi Zangief Machabo Gachi-kun Itabashi Zangief with the unconventional choices was the only one not to be involved in any ties. Emerald Fujimura Momochi MOV Tied on Momochi in the first round with Nemo, then lost out on Haitani in the second round. Sunrise Moke Dogura Haitani Tied on Haitani in the second round and got him. Flame Tokido Fuudo Mago Tied on both first and seconds rounds, and won both times. Cue the inevitable "I have MAGO" jokes. After the draft they drew lots to make two three person teams, and Nyanshi joined. Nyanshi is an organizer that started a company for running events, and founded or co-founded Godsgarden and Topanga. He ran the SFV bracket at EVO Japan 2018, and is a very well-known figure in the FGC. The exhibition match was random select, so you saw some odd pairings of players and characters. I'll keep this updated with events in the series as they are announced. This tweet says that you can apply to be part of the audience. It is free, they don't provide transportation reimbursement, you need to bring a form of legal ID, and fill out a Japanese application form. Your personal information will be managed by Architect Corporation. How to watch: if you watch live, either the Abema.tv or OpenRec.tv links will work for free, though you might need to create an account. The Abema.tv links will take you to the archive for past events, and usually you can watch those for free too, but after about a week's delay. To watch the OpenRec.tv archive, you need to upgrade your account to a premium account, which costs about $5 a month (540 yen?) They have an offer for a 7 day trial. There is a special 30 day free trial with the code "sfvallstar" (no double quotes) valid through 2018-06-30 so try that out! I recommend watching on OpenRec.tv since if the sets go long, Abema.tv might cut to something else scheduled on their "channel". OpenRec won't. This tweet has a short 1 minute interview with Daigo on his thoughts about the team draft, which I assume was immediately after it happened. Please tell me your thoughts on the draft. Daigo: "It was the first time I've done this, but it didn't go as I planned. I wasn't able to get the team that I planned for, but I'm going to do my best with the team that I have." What team are you most concerned about? Daigo: "I also wanted to get Fuudo, but he was selected by Tokido and I think that's a very strong combo. Once he got him, I thought they have a good chance to win it all." Daigo: "I haven't practiced with my teammates much up until now, but now we are teammates so I want to spend a lot of time playing with them. It would be really great if our team could win." I really liked the intro sequence, it was fun where each player showed a bit of personality. Nemo's intro peeking over his sunglasses fit him well. Very nice production values overall. 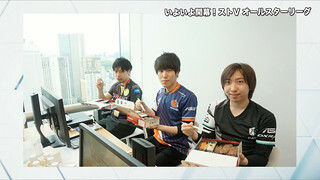 If you remember from the Draft, there was an exhibition match and the prize for the winners was a $40 bento, while the losers got rice balls that the staff made. They showed some pictures from that. I love MOV's expression. Before the first match, Utahiroba Jun (the sharply-dressed interviewer, who is actually the bassist for the Golden Bombers and a big SFV fan/player) asked Tokido what he thought of the rice balls they got (they were good!) Mago had nice things to say about Dogura and his performance in ELeague, and when Fuudo was asked for a comment he said "I'd rather show them through play, not talk" which got a good reaction out of the crowd. Utahiroba asked Moke what he thought about his team since he wasn't present in the draft. Moke is pleased with his team, and also that he was able to create his concept team of the "Kansai team" since Dogura and Haitani are both from there. Since earlier Mago had the role of "analyst" (analyzing opponents and strategizing) on Tokido's team Utahiroba asked Moke who they have doing their analysis, and Moke says Dogura. So Dogura provides some player analysis. He also said that this is the battle between the "Onigiri eaters" (both teams lost in the exhibitions) so they are both "hungry". The interview with Daigo was funny because he was saying things like "Well, you know I had to get my team by lottery, but after I sat down and thought about it calmly, it is a pretty strong team." Sako was trying not to laugh and Bon-chan had a big grin. When Utahiroba followed up with "Why do you think that?" Daigo simply answers "Because they're both good" - no higher level strategy or tactics. Daigo also said they hadn't really played together or anything, which is a huge change from Fujimura's team, where he's like "Our teamwork is great!" MOV said "I didn't think anyone would choose me if they were thinking about how well the team would get along" - they guy's a joker. He's really nice. Momochi thinks their team needs to defeat Daigo to really succeed, which given their history is interesting (the Living the Game movie goes into that if you are interested, and it is a good documentary in general). Utahiroba says that Fujimura has a cute face, and with some makeup would make a good front-man for a Visual Kei band. Itabashi says he's never seen a team with worse teamwork than Nemo's team right off the bat. This is what I expected from a Nemo / Itazan matchup. Both Kazunoko and Storm Kubo say that they haven't heard too much from Nemo in terms of teamwork, but that they think things will be ok if they win. Utahiroba asked ItabashiZ about the Rivalry between him and Nemo, and ItabashiZ said "Well, I don't think there's a rivarly but he certainly grumbles a lot about it." Also: "I think we were able to improve our relationship by spending time here today" to which Utahiroba responds "I don't think so", and ItaZ: "You really know a lot about our relationship!" When asked about the reason they won, it boiled down to "teamwork" and developing anti-Abigail strategies with team members. The Battle Points are calculated by taking the number of individual wins minus individual losses over all the 1-1 matches. So Sunrise won 8 of their matchups, and lost one, giving them a score of 8-1=7, and so on. I like how each of the games have meaning even if your team didn't win the set, it gives you something to continue to fight for. Sets are played until one of the teams has won three sets (denoted by the stars). Pretty interesting! Machabo had a great comeback against Momochi in that second game of the fourth set. What does Nemo's headband say? I literally can not read it - he later posted a picture on twitter and I couldn't make out the kanji well enough to look it up. It's essentially "I will definitely win" with a name for Mago that I don't recognize. Nemo says he thinks he lost in the previous match because Itazan's team read their order and sent oppoents in a good order. Mago's got the same headband (Nemoto's name on it) and he wanted to defeat Nemo. Moke's Sunrise has a disadvantage, as the announcers were talking about before the fight: their whole team just came back from America. Hameko and Nanai doing commentary this time. It is strange seeing Nanai, one of the regulars at the Wednesday night Fighter's Crossover Akihabara local doing commentary. In the interview after their victory, Moke said that they weren't too worried with the order they go out in because they were all confident that they could defeat their opponents characters since they all play against those characters a lot. Moke seems like a reserved guy, but when they went to Dogura it felt like he brought out some authenticity. He was bummed about his consecutive losses to Kazunoko, and thought that Moke was a really solid anchor for their team. He really thinks they have a good team with good teamwork, and then rips on Nemo's team: "Our opposing team isn't even really at team at all!" There are some laughs, and on the follow-up question (which was just they aren't a team?) "Yeah, just look at all the fear in Storm Kubo and Kazunoko's face!" That gets some good laughs, although throughout the whole match after Aurora team losses the camera would sometimes zoom in on a (stage) crying Storm Kubo or a (stage?) sulking Kazunoko. The players are clearly having a lot of fun with this heal-role that Nemo has. Dogura is really funny, and the more I hear from him the more I like the guy. During one of the breaks between matches (set 1 and 2 to be specific) the commentators were talking about Itazan. Utahiroba says that after talking to Itazan a few times, he really thinks the guy is super smart. Hameko chimes in: "Yeah, but I can't understand how he talks." <b>I am validated</b>. I always joke with my twitter Japanese translator friends that Itazan is super hard to understand. I always thought he had some strange accent from some part of Japan I've never encountered, but no, I was assured that he just has his own strange lingo. Originally the schedule was for Fujimura Emerald vs. Moke Sunrise, Nemo Aurora vs. Umehara Gold, Itazan Ocean vs. Tokido Flame. There was a relatively large earthquake in Osaka at 8am this morning, in which at least three people were killed and 214 injured. It was a serious earthquake, magnitude 5.3, but things could have been a lot worse. Mass transit was in a disarray, and while we are all relieved that FGC members all seemed to be fine (according to twitter tweets) at 7pm – right when the broadcast starts – Dogura had just got on the bullet train. It takes about two and a half hours to get from Shin Osaka to Tokyo. Dogura had quite a time just getting to the Shin Osaka station - he had to take a taxi (and those are Expensive in Japan) all the way to the station, and he asks that the teams "employ delaying tactics" or literally play "like a slow cow walking". My heart goes out to all impacted by the earthquake in Osaka, and if you have the capability, please consider a donation to the Red Cross Japan. The lineup change was only announced a few hours before the show, which also means we get to see the teams compete without having had proper time to prepare for the teams they will face. On twitter I've seen a bunch of the competitors open lounges against specific characters (I assume the ones they will face) so they might not be as prepared for these specific matches that they face today, since the order changed. I missed the first four sets live (family obligations) but I was able to watch the fifth set. In the interview before the matches, Itazan calls the opposing team "casual players" ("enjoy players" エンジョイ勢 - absolutely what I am). He said some other stuff, but as usual I can't understand half of what he says. When the interviewer asks Gachi-kun about their tactics, she says "Itazan says that your opponents are just casual players, but what tactics have you planned?" Half off frame, Machabo is completely cracking up. Gachi-kun tries to explain what a dirty casual is, and then says "oh, you don't know that?" Machabo is breaking, and Itazan has a crazy smile. When she asks Tokido about being a dirty casual, he says that Itazan is the ultimate casual player, and they are here to win. Tokido also says that if they interview Itazan after the match, the just goes on and on and won't shut up. (These are all good natured jabs - everyone is having a good time). Fuudo says if they lose this match, they really will be dirty casuals. The interview with Nemo, Kazunoko, and Storm Kubo before the matches was funny. The interviewer said that Storm Kubo had a good win rate last time. Nemo said that was because Storm Kubo had borrowed his stick (he forgot his) - this time Storm Kubo said he remembered to bring his own stick. Bon-chan's Red Bull shirt is pretty cool. Daigo thinks his team has the advantage, but they need to make sure they get off to a good start. The interviewer asked Sako about how they have won three times in a row even though they give up the first set, what is that about? He says they're just giving away the first set for free. He wouldn't answer if they would keep up that "tactic". They raised the mike levels on the team seating areas, and now you can hear the teams cheering a bit. It seems to me like Nemo is intentionally saying stuff like "all right", "good hit", etc. I at least didn't notice that stuff before, and now it is hard not to notice. Everyone was surprised when Bon-chan pulled out Karin in set 4. Remember, this is team mode, and character choices are made before you know who you will play. The commentary was saying that they expected this Karin pick was actually to battle Kazunoko's Cammy. Nemo on winner, when asked how he felt: "The noisiest opponent on the other team started to get quieter and quieter as we won, so I feel great right now!" The interviewer asked Storm Kubo why he has that look on his face, even though they won, and he said "Well, our team doesn't really have that great of a relationship, so this is what it looks like when we win." Hameko has been keeping stats on player win percentages, and when introducing Fujimura Emerald, he said that MOV wins a lot, and the team leader Fujimura has been losing a lot. The other day he tweeted out a chart showing the win rates of each player. Why did the interviewer ask Fujimura if he cut his hair? (He did.) They asked MOV about his analysis of the other team, and he said that he's a bit worried because he'll face Dogura. But he wonders if that person really is Dogura (he totally cut and dyed his hair.) Moke also says he wants to verify if that is Dogura. hah! Dogura said that he is Dogura, and it isn't like he is actually Go1 with dyed hair. The interviewer also brought up Haitani's great win record (11-1) but he just said that he has been concentrating on his matches. Momochi had some amazing air throws in that last set. Momochi was asked about how he feels now that he won all of his matches. He said he is a slow starter, but he is going strong now and will continue to do his best. Results after the fourth section. Haitani evaluates his teammates: bangs are too long. I was really surprised to see Fubarduck and Xyclops commenting on an English stream! That's great! I caught the last set live with the English commentary, and I think I'll go back and listen to the English commentary (OpenRec allows for 2x playback) just to get a feel for it. I'm very glad they have Fubarduck, who knows the Japanese FGC scene and players very well, has excellent Japanese (much better than mine! ), and really knows the SFV game inside and out as a lab-monster Mika player. Xyclops is a more emotional color commentary choice to play counterpart to Fubarduck's analytical style. For my results and summaries, I'll listen to the Japanese stream and note down anything that I thought was interesting. Now that there is an English stream, there probably isn't much need for this, but I enjoy listening to the Japanese commentary, and it isn't much more work to write this stuff down while I do it. Ayako Hatta (the interviewer) asked Itazan how he felt after a close loss to the Tokido Flame in yesterday's Section four match. Itazan said that he thought going into it that the matches would be tough, but he didn't want to show that to the opposing team. I love how Itazan still always has a smile on his face, and he closes it out by saying "Well, it was a really close set, we didn't play badly, so I'm hoping for a good match today." Always positive, that guy. He is absolutely my favorite player to watch (I'm also a big body grappler player though.) Ayako moves on to talk with Machabo, and says that the Itazan Ocean team always seems to be in high spirits, and asks him if that is still the case. This is an unstated contrast with Nemo's team and as a consistent theme since the first section has been very funny to me - even spawning some good drawings of the Nemo Black team ("black" here refers to "black companies", which are companies in Japan that under-pay and over-work their employees - also don't miss the KOF reference in the drawing by @meganeotoko). Machabo said that the did their best yesterday, and they can't worry about it now, and just want to play hard and win. Ayako asks about having to play on consecutive days, to which Machabo replies that they aren't tired or anything, so it's fine. eSports vs. pSports (thanks Ultra David!) difference there. Ayako asks Moke if they made plans or a strategy against Moke Sunrise. He says that compared to last night, two of the characters are the same (Cammy and Akuma) with the only difference being Urien vs. Mika. He says those are tough characters for him, but he's gotten some practice. Utahiroba interviews the Moke team. He asks Moke how they felt after losing to Emerald yesterday. Moke says that he noticed that their team got really gloomy after the loss, and Dogura just starts cracking up. Moke goes on about how people were not very talkative, and got a bit depressed, but on the other hand when they win everyone is happy, and they really feel unified. The stark difference between what Moke is saying, and just how much Dogura is trying to keep from laughing out loud has me confused - is Moke just making this stuff up? Is Dogura just a naturally effervescent guy? Dogura was asked about their preparation, and says that while the characters on Emerald were difficult to prepare for, the ones they face in Itazan Ocean can be prepared for, and they expect to do well. 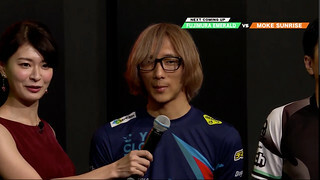 Utahiroba asked Dogura about his new look, and Dogura said that often people tell him he looks like someone from a TV program a long time ago. This is likely a reference to Mr. Bater, which I know literally nothing about, seems like a character from a comedy routine back when Downtown was young. Dogura said he might try to dress up like him today, but it was just too embarrassing. Haitani is the last to be interviewed, and he's a pretty straight guy. Utahiroba asks him what he things of his two teammates' mood, and he takes some time to look at them, then says "they've got long bangs". He's playing the straight man through and through. Utahiroba was going nuts during Machabo's comeback in the third set. Post-match interviews. When asked about their quick 3-0 win, Moke says that his teammates really pulled through winning the last rounds. Ayako says that Dogura had an impressive victory in his second set vs. Machabo. Dogura says that he had a lot of good luck in these matches, and when it is down to both players with no life, either one could win. Ayako says that this ends the first half of the tournament (it goes on through July) but wonders what Dogura expects for the second portion. He says that if they had not won this game, for the rest of June he would keep having the image of Haitani's face haunting him, and the cameraman quickly cuts to Haitani with a disapproving look. Haitani thought his teammates played well, and expects to do well in the future. Pre-match interview with Nemo Aurora. Ayako says that Nemo's team beat Umehara Gold yesterday, and that there was a very noisy person on their team (Bon-chan, the ultimate cheerleader), and asks what Nemo thinks about today's match with Emerald. Nemo, never letting anyone down, says that both he and Kazunoko do not like MOV. He doesn't have a lot of experience in the Chun-li matchup, so they arranged to have Storm Kubo face MOV in the first matchup. After that, Nemo says they'll win the other two, and looks meaningfully at Kazunoko. Ayako follows up with "So, are you putting a lot of pressure on Storm Kubo?" "No, I'm asking him to do his best, and supporting him." Talking to Kazunoko, Ayako says that their team is now at two wins and two losses, and it seems like their team has become more friendly with each other, is that the case? Kazunoko says that Nemo is always telling him about his play, and that it is like a religious training exercise every day. Ayako confirms that after matches Nemo brings up his problems, and Kazunoko says that yes, today he's going to try to play such that there are no problems for Nemo to tell him about. When talking with Storm Kubo Ayako says that Nemo is giving him encouragement, right? Storm Kubo says that, yes, actually Nemo is a really nice guy, and consoles him when he loses, gives him lots of advice, and is a very nice person. Nobody seems to be buying it, and Nemo is trying to keep a straight face when they zoom in on him. Post match interviews. Ayako asks what kind of practice they will do over the break of the RAGE SFV League. Fujimura is a bit non-committal saying that they will get together and play together if there is time. Momochi says that their teamwork was good; when Momochi lost the others would win and vice versa. Ayako asks MOV about how he felt playing Storm Kubo twice, and winning the third. She said it was a big help to the team that he won that one. MOV says, great, I at least wanted to win once if I have three chances. He also thinks that his teams were great this time, and they really carried him, but he's glad that he was able to get the win in the last game. Pre-match interviews. Ayako asks Daigo if there is anyone on the other team that he really doesn't want to lose to, or that they are focusing on. Daigo replies that this is a team event, so that is besides the point. He does say, however, that their teams are a bit of a tough match. While it would be interesting for the event itself if they lost, Daigo doesn't want to lose. Ayako asks Sako if they will be able to depend on his Menat again, and he says "absolutely". Ayako says that everyone likes how Bon-chan is a great supported and cheerleader for his team, but that the other team has Mago, whom everyone loves. Bon-chan says that he'll be even louder today so that they can win. Tokido says this is an important match since they have lost 3, and they really need to win this one to stay in it. Fuudo says that he plays a lot with all their opponents, but he would like to play against Sako today. Utahiroba is trying to set Mago up for some interesting by asking him for comments about the other team, but Mago just says he'll try his best. Utahiroba tries again: "Bon-chan talks a good game, and is looking forward to trash talk, what do you think?" Mago says: "What, was he talking?" and gets a good laugh out of that. Post-match interviews. Daigo said that in previous matches, it didn't really matter what order he sent people up in, but in this match it was important to get the right match-ups, and they just had better luck in getting good orderings. Particularly the third set had bad matchups for their team. When asked about what they will be doing over the break, Daigo said he'll be busy going to overseas events, but they will practice together if they can find the time. Ayako asks Sako for his feelings on his win against Tokido in the last matchup. He thought his movement was good, but hard to win. He thought his teammates did well. Ayako asked why Bon-chan used Karin in all his matchups today. Bon-chan said that since you had to decide your character in advance, and he thought that in two of the three matchups Karin was better, that is what he went with, and she did good work for him. Then Ayako asked him about his feelings going up against Mago three times. Bon-chan said, "Of course I thought I couldn't lose, and we were able to win because of that." He got a laugh out of that. As the analysts desk was going over the results, before the highlights came out, Ayako-san talked about how it was great that the "Dirty Casuals" from the other day won their match. I'm translating it as dirty casuals, but really it is エンジョイ勢 (Enjoy crowd / people who enjoy) so closer to just "Casual players" but the way it is used is closer to noobs / dirty casuals. Hameko and Utahiroba (Yamato didn't have as discernible a reaction) both had pretty big grins on their faces, and Hameko asks Ayako-san: "Did you learn what 'casual players' means?" She replies, "Yes, you know, they are people that just enjoy the game, they aren't like hard-core …" She clearly doesn't truly understand (not that I, as a second language speaker do either.) Hameko tries to make it more clear: "Well, there's more of a deep context here. Like, maybe they've never won in a tournament, it's kind of word used for trolling. That guy (Itazan) uses Japanese in a strange way, but at any rate it was a really good fight, and Umehara Gold had some favorable matchups." I find Ayako Hatta to be endearing, although I would really love it if they could get Yuka Kuramochi (a Idol and Mika player) on sometime - she's done work with Abema in the past. They do have an interesting collection of people on the desk, it is a lot of fun. Results after the fifth section. I really enjoy watching this format and tournament. I enjoy seeing the interaction between the players a lot, and like the interviews. We don't see that at open entry tournaments, which is one nice point about invitationals. The production values have been really good, and I'm happy to see OpenRec bring in some people to do commentary in English. The matches have all been very high level as well, and exciting to watch. It is nice to see experiments around how to make entertaining FGC content, and the people running the RAGE tournaments have done a good job of keeping things close to the community with their choice of analysts and commentators. Nemo is very happy his team beat Mago. Storm Kubo is very sad when he loses on Nemo's team. The half season review special had Tomoaki AYANO, the SFV Arcade Edition Promotion Producer from Capcom, on as a special guest. He dressed up as Chun-Li, which seems to be a thing for CapCom employees. They spent some time explaining how Team Battle Mode works and specifically how the order change feature works - since at RAGE SFV All Stars League Powered by CapCom they have order change enabled. They went through the players, talked about their win rates and results, gave some nice analysis. They looked at stats like "who has the best throw tech percentage" and showed some footage about that, talked about how throws and teching works, and the mentality behind it. They had a section called "Hameko's Lab" where he talked about some interesting situations in the first half of the league. He first used a match of Haitani Akuma vs. Tokido Akuma to talk about health gauges, and explain some basic stuff about EX gauge and V gauge. Haitani had a large health lead, and Hameko explained why he busted out an EX Goshoryuken when Tokido went on the offensive, and why he did that taking all the different gauge values and match situation into account. It is pretty basic explanation, but very useful for people who don't know the game well - e.g., exactly the kind of stuff we need to make the higher level strategic game more accessible to casual audiences (of course, we see a lot of this with all the mainstream efforts, which is great). Hameko then talked about a great comeback Machabo Necali had against Momochi Kolin. There were a bunch of segments like this, I won't summarize them. He spent a really long time walking through one of Sako's Menat combos and how that worked, which was actually super interesting to me. I haven't played around with Menat at all, and hearing him talk about how the combo is actually performed, and what points to pay attention to because of the difficulty, was quite interesting. Ayako had her own little section, and she focused on a clip where ItaZan took the mic from Utahiroba during an interview, stressing how ItaZan is the only one who grabbed the mic out of the interviewer's hands. It was pretty funny. "Oh, that's what your corner is about!?" Ayako also brought up a time when Storm Kubo lost, and the camera cut to him "crying" with his face in his hands. He was actually smiling, but the dynamic on Nemo's team is very funny. She really thinks Nemo team is interesting because of their inter-personal dynamics. Of course Ayako had a retrospective on the time when Dogura came in with dyed hair, and everyone was doubting whether it was actually him. She was saying that after Dogura cut his hair, they had to schedule emergency pictures and filming for his introduction because he looked so different, and the next night they got his new introduction in. I didn't even notice that! There was a bit more of the above, they took a break, then played the live action Kenny Omega Cody trailer. After that Hameko walked through a Cody demonstration with Tomoaki AYANO. Later on they had a exhibition between Hameko and Tomoaki AYANO, which Hameko won (FT1). Finally, they talked about the Capcom Rookie Caravan, a series of five 64 person open tournaments that will be held in Japan to find the "next Star SFV player". I have the dates of that event at my list of FGC events, even though they are being held all across Japan. Moke Sunrise interview. Ayako starts out by talking with Moke, and saying that everyone looked very happy as the entered, and she wonders if they had fun in America. Moke says the beach was really nice, and all three of them had a great time together. Then she talks to Dogura, and he talks a bit about jet lag, and asks Machabo to take it easy on him. Haitani says he's worried that he hasn't practiced enough for today's matchups due to travel, but will do his best. In Itazan's interview, he says that since they lost the first time they met he really wants to win today. He also calls out Dogura as the Moke team's mood maker, so if they can bring him down, get him depressed, then the team should fall apart. Ayako also says that she noticed that Itazan's got some peeling skin on his nose, and wondered if he got a sunburn. He says he might have got a small one, after the tournament ended. Ayako says that Machabo had a really good hit rate on his anti-airs (but she had a really hard time getting the words out, it was cute) and asks if they can count on that again. Of course. There isn't much you can do with that question IMHO. She asks Gachi-kun what he's done in prep for this. He says he's prepared for Moke-kun and Dogura, since he lost to them last time. His flat delivery has everyone laughing. Dogura's expressions throughout all his matches were great. Ayako brought up Machabo's win on an anti-air, and he said "yeah, those come out automatically." Gachi-kun said he's a bit tired from jet-lag. Ayako asks him to get a lot of rest tonight. Ayako congratulates Fujimura on his CEO win, and asks if that will have an impact on this game. Fujimura says he's in good spirits since things have been going well. Ayako asks Momochi about Cody, and he says that he's been practicing with him and would like to bring him out if he can. She asks who he would like to face, and he says he wants to play Mago's Cammy and he can use Cody in that match-up, but probably not the others. Ayako asks how MOV is doing, and he says he hasn't slept for two days, and even though he doesn't like enery drinks, he's prepared a bunch of those. Man, that international travel woes are real for the Japanese world warriors. Momochi brought out his Cody in the 4th set against Tokido, using VTII. In the interviews, Ayako says that even though Fujimura lost the first match, he was smiling. He said yeah, but he was crying inside. With the three wins, Fujimura says that even MOV should be satisfied now. Ayako of course asked Momochi about Cody, and he said that since they had already got two stars, and he thought they had some leeway. MOV talked a bit about how in the RAGE series there are only a small number of games, so even though he is tired, he's able to really focus on the matches. I didn't have much to say about Umehara Gold's interview, it was all pretty normal stuff. Nemo says that since Storm Kubo was just issued his Pro License, Nemo expects him to single-handedly deliver the victory over Umehara Gold. Ayako congratulates Kazunoko on winning two tournaments at CEO, but he says he didn't win in SFV, so wants to win here in RAGE. Ayako asks him how much his prize money was for both of those wins: "No Comment". Storm Kubo says he wants to do well now that he has his pro license. The double KO with Daigo and Storm Kubo in set 3 was pretty cool, and the first in the RAGE SFV All-Star League. Ayako asked about why Daigo's team again lost the first match, but then ran off a consecutive run of three wins. It isn't intentional. Bon-chan says that since Nemo Aurora was the only team they lost to before, and he was 0-4 that time, he wanted to win. Ayako asked why he changed to Karin, and he said that he likes Karin better for the matchup with Kazunoko. Results after the sixth section. Just look at Dogura's expression. Tokido's making faces to disturb the other team. Today on the analyst desk we have Ayako, Utahiroba, Hameko, and Nanai. Utahiroba was talking about how everyone was tired yesterday from returning from overseas, and then mentioned that Ayako has started to use twitter and follow FGC people. She was talking about how Mago opened up a lounge for SFV and was looking for Cody players, to counter Momochi. Ayako really seems to like Mago. Sunrise Interview. Ayako asks how Moke feels, and he said he got a lot of rest. When asked how he feels, he said to just look at the color of Dogura's face, and you can tell how things are going. Dogura had a crazy smile, but yesterday people were complaining that he looked really dark and was super tired, and just didn't look well. When Ayako asked Dogura about how he felt yesterday, he said he wasn't doing great, but was ok. But then when he looked at the monitor where he was displayed, he thought he looked pretty bad. When she asked how he felt today, he said he's doing great and that "There's not a single thing that I don't know about Cody!" He's studied up on the matchup. Ayako asks Haitani about how he felt - she thought he looked ok, but he just sort of sat glumly in his chair. He says he wasn't tired at all, but is a bit tired today. Ayako asks him about his good win rate and if he'll keep that up. He just plays it kind of straight, and Ayako seems to have a tough time getting him to open up. I find it pretty funny because she's trying to ask these nuanced questions with setup, and he's just like "yeah". Emerald interview. Fujimura is in his spirits. Ayako asks if there is any player on the other team that Fujimura is worried about. "That guy. The Akuma user from team Fudoh" [the same team that Fujimura is on, the one founded by Momochi]. Ayako: "the person who looks really tired?" Fujimura says that even though Haitani said he's tired, he's strong. When Ayako talks to Momochi, he says he put in a full night of work and his Cody is 1.5 times stronger now, and that he would like to face off against Haitani (who has had his eyes closed this whole time.) Ayako asks MOV how he's doing after doing really well yesterday. MOV says he got good results by relying on Energy Drinks, but got a lot of sleep. When he woke up, his whole body was sore from long flights and being stuck at airports for hours (he was in an airport for over 16 hours on the CEO trip). When asked who he wants to play, he said since he didn't get to play Haitani the first tie (who still has his eyes closed) he would like to fight him. Get a gif of sleepy Haitani? When the team lineup for Set 1 was displayed, Utahiroba was shocked that Momochi chose Kolin instead of Cody, and gave him a bit of grief for that with his "I am Cody" talk (from twitter). Emerald really steamrolled over Moke Sunrise in these sets. Ayako asks in the post-game interview why Emerald did so well, and he replies that it is probably because of the bonds the teammates share. I always get the impression this is drawing a contrast to Nemo Aurora, and from the studio laughter I think the others agrees. Ayako comments that Fujimura often goes up first, and wonders if he is trying to get his teammates motivated by winning the first matches. He says that is true to some degree, but also he can handle any of the team's characters well. Ayako asks Momochi why he didn't bring out Cody, and he said he thought it would be a bit tough to bring him out today. He thought the team did really well coming out +9 on this match, but each of the games could have gone either way so it was deceptively close. Ayako says that MOV was the only oen that didn't play against Haitani. MOV thought he played well in that second set. Ayako asks if he feels pressued when his teammates play so well, and he says that there is a good kind of pressure there. The analyst desk was also joking about how Fujimura used the phrase "bonds between our teammates". Flame interview. Tokido's entire team is wearing headbands, his days "Defeat Inoue Ryota", who is Kazunoko. Ayako asks why they are all wearing those. She says that previously Nemo and Tokido had headbands, but who prepared these ones? Tokido did. He wants to pull them down to the bottom. Fuudo's headband is "Default Nemo Noaki". He'll fight Nemo first, so he chose him. Fuudo says that his team is the "Death Team", if you lose to their team, you won't be able to rise up in the standings. Ayako says that they still can make it into the final playoffs, but Fuudo says that while that is true, they are more motivated to drag Nemo's team down, soliciting laughter from some of the other players, and a sad head shake from Kazunoko. That framing puts less mental pressure on their team than looking at it the other way. Mago's headband has his own name on it, because he doesn't to lose to himself. Ayako confirms that he wants to get over a mental block he has himself, and says that it's "kawaii", leading to more laughter all around, and an incongruous shot of Storm Kubo when Mago is talking about how he lost because of himself (Storm Kubo seems to commiserate). Aurora interview. 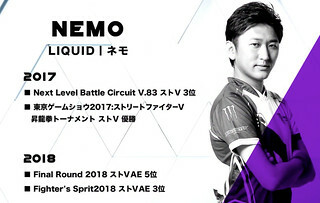 Nemo says it is fine to try to make people laugh before the match, but he says on their team one of them tries to make them laugh during the match. (It's Mago). Ayako asks who he wants to play against, and he busts out Mago's legal (Hayashi Kenryo) Kazunoko says that if everyone plays normally and nobody tries to disturb them, they should win, and then we get a shot of Tokido, making faces. Ayako congratulates Storm Kubo on getting his pro license, and that he was congratulated by Nemo in his own style, but then says his results weren't as good as he would have liked. She did say that he beat Daigo, and did he get any confidence from that? Storm Kubo replies that he just recently realized, at 2am last night, that he is very nervous in his matches, and he thought it was because he was scared of his opponents, but actually it's because Nemo-san is standing right there behind him. Nemo got high fives from both teammates after his win, drawing some comments from the analyst desk. Ayako says that Nemo's team looks very happy. There was some general talk around that. Ayako asks Kazunoko about the order people went up in, and also Ayako mentions that she saw on Twitter that Kazunoko said on twitter that he does nothing other than fighting games. Then Nemo said "you can get lots of SFV practice", and he did. Storm Kubo said his teammates supported him when he was a bit down, and his team has a muted response to that, drawing laughs from the crowd. Ayako says that their team seems to have more solidarity now, and Storm Kubo says he hopes it lasts at least until they go back to the green room. Pre-game Gold interviews. Ayako asks Daigo why his team has been playing so well. Daigo seems confused (he always seems confused) and answers "Well, I guess it is teamwork. Right? Isn't it?" Daigo seems a bit out of sorts, but does say he wants to win the first set, even though he isn't feeling that confident. Nothing exciting with Sako, he says he'll do his best. Bon-chan says that last time against ItaZan Ocean he won a lot, and he wants to do about as well again this time. Ocean interview. She asks ItaZan if he is feeling pressured. He says no, he's just playing at his own pace. He says that yesterday they targeted Dogura as the person who sets the pace for the team, and this time (he thinks about it) Bon-chan sets the mood for that team, so he's going after him. Machabo feels good because they did win the first two sets yesterday, even though they lost the last three, so he feels good about those wins at least. Gachi-kun seems in good spirits, and Ayako said that everyone at the analyst desk would try to figure out if he was going to jump forward at the start of the round or not. He says that he heard them, and was thinking about whether to jump forward in the last match or not. The analysts seemed to get a kick out of impacting the play in some way. Wow, that first game in the third set (Bon-chan vs. Machabo) was impressive. Ocean interview. Itazan was worried that his team wasn't in good spirits, but his teammates really played well and pulled them through. Ayako asked about Itazan's prepration for Sako, since he beat him in the third set. He lost in their first meeting the previous time around, and he thought he hadn't prepared enough for the match-up. So this time he prepared a bit more for it, and looked forward to meeting Sako. Ayako asked Machabo how he felt after two close wins. He said he felt pretty relaxed. She asked what he thought of Sako's Menat, and he was worried about it at first, but prepped for the match-up a lot, and thought he had a handle on it. Ayako also asked Gachi-kun how he was feeling, and he said since he was so tired yesterday, he got a lot of sleep this time, and felt better. When she asked about how he felt winning all three matches against each member, he was happy about it - in the previous meeting he only won once, and prepared a bit this time. The analysts talk a bit about how Itazan's Ocean team all seem happy and friendly, contrasting them to other teams where the environment doesn't seem so good. (Unspoken: Nemo Aurora). Results after the seventh section. Ayako and Utahiroba open the show with some fun banter. She's apparently been getting some lessons from Utahiroba, who taught her some combos. She also decided that she wants to play on stick instead of pad. Another theme of the pre-game was talking about how Tokido Flame needs to win tonight. Hameko and Yamato are on the analyst desk. It seems like Yamato and Nanai have been switching off on that second seat position to the ever-present Hameko. On Nemo's introduction card, did you see the shout out to NLBC? 2017: Next Level Battle Circuit V83 SFV 3rd. Sunrise interview. Ayako asks Moke if they've had a meeting talking about their loss in the previous section, and Moke said that he thought it was a tough matchup for them, so he's not too surprised. Of course he wasn't happy about it, but he doesn't want to get stuck on it, and thinks they'll win this time. She asks Dogura about what kind of preparation they have done, and Dogura says that they have some similar characters on their team so they could prep for that. He also said that in the previous session they lost so completely, that as a team they just decided to forget that the entire thing ever happened. Dogura also said that he was really close to beating Momochi, but lost, leading to that 0-3, 0-3, 0-3 result, and when he apologized for losing to the team, Haitani said "I'm glad you lost". When Dogura asked for clarification, Haitani said "If you had won there, that would have just been the worst. What would we have done?" Ayako says that it sounds like they aren't too worried about it, and Dogura agrees, we lost some cleanly, there isn't much to feel bad about. When Ayako talks to Haitani and says it looks like he was smiling and happy earlier, he laughs a bit. She asks how he's feeling, and he says he just came back from overseas that afternoon, so he doesn't feel like he's in great shape. Ayako says that is very unlike him, but he says to keep on believing in him. Aurora interview. Ayako asks Nemo's evaluation of his teammates. Nemo says that Kazunoko's value has really gone up. When asked about Storm Kubo, he says that because of the order and people he's been up against, it was only natural that he would have the highest win rate, he really needs Storm Kubo to win. The "concept" is that they put up Storm Kubo in a position where he will win for sure, if he doesn't it's a big problem for the team. Then one of the others will win once. Kazunoko confirms that Storm Kubo should win, and then he just has to win once. He thinks he'll have another chance today to increase his value. Ayako says that she really supports Storm Kubo, he complains that she is the only one. She asks if he feels pressure to win because of this concept, and he does of course feel pressure, but does want to win. Man, Dogura and Nemo consistently give great interviews, and make this part of the show real entertaining. Interview with Aurora. Ayako says that Nemo was really cheering on his teammates. Nemo says that they really had to win today. Kazunoko affirms that it was an important match, and was glad he was able to do work. When Ayako asked him his self-evaluation, he says he just followed Nemo's orders, and did his work, so he gets about 50 points. Ayako says that's so low! You should give yourself more points! But Kazunoko just says that it is all thanks to their glorious leader. Ayako says that Storm Kubo won all his matches, and Storm Kubo says that it was all due to their leader, and he gave excellent direction. The announce the Japan vs. Korea match that will be held before the RAGE SFV All Star Grand Finals on the July 26th at 8pm JST. The three members of the Japanese team will be chosen by popular vote, and will face off in a 3-3 team battle. Fujimura Emerald interview. Ayako asks how Fujimura is feeling about this upcoming match after a great win the previous session. Fujimura says that he played Itazan each time before, and he really doesn't want to play him again. Ayako tells Momochi that he's on a run of five wins a row, and he's a bit surprised by that. She asks why, and he talks about how people aren't used to Cody yet. They joked around a bit about putting pressure on Utahiroba, who really wants to see Momochi's Cody. Ayako asks MOV about why he has such a high win rate, and he replies that he thinks he's at his peak right now. Itazan Ocean interview. Ayako tells Itazan that they've really gone up in the ranking with their win over Umehara Gold, but if they win today, there is some team that will lose their motivation. Itazan says that team really never had much motivation in the first place, so they aren't worried about that at all. He's more worried about teams higher in the rankings. Itazan also says that there is someone on the other team that is important (camera focuses on Momochi) that they want to de-motivate. Machabo has a hard time understanding Ayako's question, which was basically saying that Itazan is good at reading their team feelings. In the end she just ran on to congratulate Gachi-kun on his recent CPT win in Indonesia. She asks how he feels, and he says great! This whole team is laughing and looks like they are having a great time. That match between MOV and Machabo in the second set was crazy. What a comeback. Momochi pulled out Cody in set 3 vs. Itazan for the "Final Fight" battle. It is interesting to hear the chatter during the breaks - at some point they started using boom mics so you can hear. In between sets 4 and 5, Momochi was saying that they should put up Fujimura first, and he'll run into Itazan (I didn't catch the full conversation though). Post-game Ocean interview. Ayako is super excited that they won, and took over first place. I don't understand what Itazan is saying, but he was talking about how Umehara and Fujimura were on top, but now they are. He also really thanks Machabo for his play. Ayako asks him about why he is so good in close matches that come down to the wire. Machabo says that it suits him when there's a bit of pressure and all you can do is do it. Ayako asks Gachi-kun how he felt going into his match in set 5 after Itazan lost, whether he was pressured? He said he was like "uuhhhhh". He thought the other team had a good read on him, and Machabo told him that too. Pre-game Flame interview. Ayako opens with Tokido by asking about their motivation, since they can't make it into the top 3 any more. Tokido says that since they can't make the top 3, they are motivated to show everyone the hard work that they put into training, and let the people see some good play. Fuudo says that they want to bring more excitement and fun to the tournament. He wants to make it so that you can't predict who will be the winner (be a spoiler). Ayako tells Mago that hearing what Fuudo is talking about Mago is a perfect man for the job. He protests, but does say that he feels like he's getting stronger with each day. Pre-game Umehara Gold interview. Ayako asks Daigo how the team feels after losing three straight sets. He says they're still in 3rd place, and the team mood hasn't changed much. Ayako asks Sako about what preparation he has done. He says these are people he's played a lot, so he has prepared for them, but doesn't give anything up. Ayako thanks Bon-chan for always cheering his team on, and asks whether he'll use Karin since that is what he used against Tokido Flame before, and it looks like that will be the case. When Daigo lost the first round of his set 3 match against Mago, you could clearly hear Bon-chan in the back saying "Don't worry about it, that's just the kind of game this is". After Daigo beat Mago in the 4th set, Bon-chan told Daigo that he should properly thank Mago (for letting them extend to a fifth set), and Daigo did give a proper "Thank you" to a very unhappy looking Mago. Fuudo, sitting next to Mago said "it's getting exciting now", and then Mago replied "Yeah, things are really getting exciting now" in a very depressed, dead-sounding voice. He did laugh after that though. Post-game interview. Ayako asked Daigo about why he was so happy when his teammates won. He said that he was putting in practice all day for the upcoming overseas E-League matches, and was really pretty tired. He didn't feel like he could concentrate well, and wasn't too confident, and so he wanted to rely on his teammates. Ayako asks Sako about the match-up with Fuudo, where he lost before, but won this time. Sako says it is always a tough fight with Fuudo, but he thought about it a lot, and was able to pull out the win this time. Ayako asks if Daigo and Sako were able to hear Bon-chan cheering them on, and Sako says that yes, he could hear him, and he was a bit loud actually (I don't think Caba needs to worry though). Ayako asks Bon-chan what he thought about the game. Bon-chan said that he was surprised when Daigo told him he wasn't feeling so great, and didn't think things were going well in the first half, but then the team started doing better. He really felt like the sets today felt like a real team battle. Results after the eighth section. Interview with Tokido Flame. First up is Tokido. Ayako starts by saying that in the last session, Tokido won four times, and then over the weekend Tokido "won an overseas tournament", which while true, underplays the scope of that E-League win in my opinion. She says it seems like he's really doing well, but asks how he feels going into the match tonight. Tokido answers that he feels great, and he thinks his teammates are in high spirits as well. Tokido says that his goal is to get his team to 5th place, and then go out and eat Yakiniku. Ayako asks if Tokido will foot the bill for the team, and he says "of course", but I can't help but think that to himself he's thinking about that E-League money. Ayako asks Fuudo how the feeling on their team is now, and he says that while the first week was a bit tough, but now since they can't make the grand finals the pressure is off. Ayako asks if their team is the one that is having the most fun now, and Fuudo says "well, I guess you could say that" while Itazan's team is laughing. When Ayako talks to Mago, she says that last time his teammates were saying that if he beat Daigo, then he would be even (in terms of wins), and he did win. Mago responds that he did then lose the next two matches, going back into negative territory. Mago says that he plans to win stylishly and go to Gyu-Kaku (a nice yakiniku place). Itazan Ocean interview. She says that last time there was a rumor that Itazan had a blue notebook full of info on the other team, and asks who Itazan thinks is the lynchpin on the other team tonight. He says it's not Tokido, who won a big tournament (but he led us on - I thought it would be Tokido, until he threw in that "but not him" at the end) and instead points out Mago. Mago, who everybody loves so much, and actually everyone on Itazan Ocean loves him too! He would like Mago to have some nice meat for dinner, and at this point Ayako and Itazan are both really excited and talking how cute Mago is, and I just can't really understand what they are going on about. Ayako moves on to Machabo and asks him about his motivation. He says a win or a loss will have a big impact in the standings. Ayako moves on to Gachi-kun, and says that when she checked twitter, Hameko had posted a Itazan to Japanese dictionary (which I've been using a bit recently) and Gachi-kun said in response to that that there were lots of things Itazan said that he didn't understand either, so it was useful. The analyst desk jokes around a bit how, if Itazan concentrates very hard, he can speak like a normal person for about two minutes. The analysts keep commenting about Itazan's blue notebook he references before he plays, and call him "The blue famous detective" (blue, from his team, and the famous detective references Detective Conan. Itazan Ocean post-game interview. Ayako asks about how things were since they won the first two sets, then lost the next two. Itazan talks about how this happened a few times now, and the momemtum in the game is important. The opponent adapts, and you have to respond. He's really happy with the win. Ayako asks Machabo how he felt about today's match against Fuudo, since this was his 4th time facing him. He wasn't sure he's faced Fuudo that much, and Ayako asks about his comeback against him which changed the momentum. Machabo says he plays Fuudo a lot, and he thought it'll probably go like it usually goes, and he played that way and things went well. With this win the reserve themselves a spot in the top 3, and Gachi-kun says he wants to be able to make a contribution to a win in the finals. He's going to look back at his play. Fujimura Emerald pre-game interview. Ayako asks Fujimura how he's feeling about facing the 4th ranked team from their 2nd place position. He says this is an important match for them too, and when asked about who he's worried about, he says it's Nemo. Momochi was asked about how he feels, given that he has the 3rd highest win rate. He says he's doing well, he came back from E-Leauge with Fujimura, and he's really sharp right now. Ayako asks whether he'll play Cody or Kolin, but he doesn't want to answer that. Ayako speaks quite gently to MOV, asking him if his heart has healed after last week's sesssion. MOV says that he went up to Niigata over the weekend for an event there – there was a college festival out in Niigata with some eSports component that Itazan attended, and MOV was at Bon-chan's road trip out there as well – and he was able to refresh himself with the nice country air and food. Ayako asks if he was able to meet a lot of fans there, and he says that he thinks all the fans were for Bon-chan, but some people also cheered him on in RAGE as well. Nemo Aurora pre-game interview. Nemo came wearing glasses, which Ayako asks about. He says that they are made to cut the blue-light from monitors, so computer glasses essentially, that will help him concentrate more (he tweeted about that earlier actually) and he bought them on the assumption that they will let him win to get prize money. He says it is impossible for their team to lose. Kazunoko says that he has practiced hard and taken care of his body. Ayako asks him about Nemo's insistence that they can't lose, so Kazunoko says that he will do his best to follow his leader's orders. Ayako asks Storm Kubo if anything has changed since he won three straight, but he quickly denies any change. He wants to do his best for his leader. Post-game Fujimura Emerald interview. Fujimura says that his teammates really did a great job, and MOV in particular had some great plays. While Ayako says that Momochi had a good win rate today, Momochi says that his win rate he thought was low, and his teammates really saved him there. When asked about his strategy for using Cody, he says that he had practiced a lot with Cody for the other team's characters, but the opponent players were very strong so he wasn't able to move around and play as he wanted to. Ayako asks him about his impressive win in the last set, and MOV says that last when he lost in the final deciding match against Itazan Ocean, it was very tough for him. He's really glad he had another chance to redeem himself and is super happy. Ayako asks him if going out to Niigata with Bon-chan's roadshow and eating nice food and hearing from his fans there helped him out here. He says, he thinks so, and then says that a fan from there actually came here tonight, and he starts to bow to the person offstage. (Damn, I'm going to have to see if I can get tickets into one of these things to see it live.) Ayako about what he wants to do next, and he said that since his team has made it this far, he wants to face off against Umehara Gold and take over first place. As hard as Itazan is to understand, MOV's languid, relaxed speaking pace is similarly easy to understand. Pre-game interview. Ayako asks Moke what they plan now that they have been eliminated from the finals. Moke says that he takes responsibility as the leader, and the team's spirits are low. As for motivation, he says that there is a heckler on the Gold team that is really annoying (he's talking about Bon-chan, and we have nice camera work cutting over to a smiling and laughing Umehara Gold team). They want to shut him up with their play. Ayako asks Dogura how his neck feels (I guess I missed something and his neck hurt in some previous interview / tweet?) and he says that he is still in pain. She asks if it is due to all the international travel. Someone's mike gets a zipper opening and I didn't really catch what he said, something about it just coming on explosively. He says that it shouldn't impact his play, but that he has to tilt his head a bit to feel normal. Haitani says that his motivation is to keep Bon-chan quiet. Umehara Gold. Ayako asks how Daigo feels, and he says since he just got back from overseas, not so great, but he's focused on RAGE now and should be ok. Sako says that he's thoroughly prepared (super short interview!) and then Ayako asks Bon-chan about how he feels when the other team's entire motivation is to just shut him down. Bon-chan says that he thinks they've misunderstood the point of this tournament (gets some laughs) and says that even if he keeps quiet they wouldn't win. Japanese trash talk. They talk a bit about the Rookie Caravan, where MOV will take part, so they talk to him for a bit about it. Ayako asks about what kind of Rookie MOV is hoping to find, and he says someone with a special type of strength, that can shine in their own way. Ayako says that MOV's Chun has a particular style of his own. She asks if they are looking for something about strong players, or more about the player. He wants to find someone that can work hard in difficult situations, and make a good teammate (I believe there will be a team battle with a pro+rookie from each of the local qualifiers as the final). Ayako asks MOV how he got started in Street Fighter. He says he grew up in the Fighting Game Generation, so he just naturally started playing. The reason here is standing here now is because as a middle school student in the 3rd year, they were playing SF3 and he went to the National tournament with Tokido and got 2nd place. If that hadn't happened his life would be completely different now, and the Rookie Caravan is an opportunity for others to have a big break, so he feels a lot of responsibility to choose the right person. Post game interview with Umehara Gold. In the 3rd and 4th set Daigo's team decided order by rock-paper-scissors, and Ayako says Sako did well to win the last two matches he played. Sako said they didn't know who they would go up against, so that was as good as anything else. Dogura apparently yelled "Quit doing rock paper scissors!" Bon-chan says that the other team prepared for his cheering, and when he got excited they just downplayed it. Results after the Ninth section. They introduced the Korea vs. Japan special battle, and had a video from Infiltration, who speaks very good Japanese. He just thanked them for the invitation, and said that Korea will definitely win. Itazan Ocean pre-game interview. Ayako asks Itazan what he thinks about the importance of getting the first seed: 2nd and 3rd place are handicapped because the 1st seed automatically gets into the grand finals. He's not super motivated for this match, Ayako asks if that is because his "Master" (師匠 - teacher, refers to Storm Kubo who "taught" ItaZan Abigail) is on the team. He says, no, that's not it (the camera is set square on Nemo) he likes him, and he also says he thinks Kazunoko is also a very good player, but the person that is "pulling their strings" isn't any good, and he feels like he has to win in order to fight for Justice. Ayako summarizes Machabo's last encounter with Nemo Aurora where he won four matches, and asks if he also thinks he's in a good position for today's match. He says he's particularly good at the Abigail matchup, and hopes that he gets to play Storm Kubo. Ayako asks Gachi-kun if he prepared for this match. He said he did, and he prepped for Nemo and Storm Kubo, and thinks things will go well. Nemo Aurora pre-game interview. Ayako seems a bit hesitant to approach Nemo, and after asking him if it's ok, she asks Nemo what the team's mood is. He says that their team is confirmed for 4th place, and he places all the blame on Storm Kubo. He goes on to talk about the "business expenses" he used to buy his new blue-light cut glasses (see previous discussion) and the costs for the "stick rentals" will have to be deducted from Storm Kubo - well, they will talk it out as a team later. Ayako asks if he is going to withhold pay for Storm Kubo today, and Nemo says that it all depends on his performance. Ayako goes over to Storm Kubo, and says that she has been really worried since the last round because Storm Kubo didn't have great results, and she asks how he has been spending his time. He says he is doing everything that he can, working hard at his part time job (not sure if that is referencing something with Nemo or not) and practicing a lot, and just trying his best. Post-game Itazan Ocean interview. Ayako asks what Itazan thought about the result, winning three straight. He was happy that they were able to get to the second seed, and he felt like they administered Justice, and in addition were able to "purify the evil spirit". 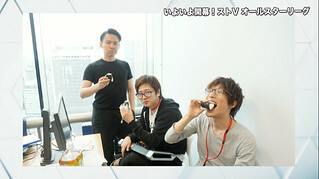 Their team will split up now, and Itazan looks forward to seeing the expressions of "those two" and looking after them. Ayako asks Machabo about his performance, meeting up with Kazunoko twice. He wasn't happy that he lost that second time, but says that the first time got the star, so he was happy about that. Ayako says that Gachi-kun really dominated Storm Kubo, and he says that since he lost the first time around, he prepared a bit and was glad that he could bring back the win this time. Since it is the last session, Ayako also interviewed Nemo Aurora. She asks how Nemo feels. Nemo says that he didn't prepare enough. Ayako asks about whether he feels like he grew over the RAGE series. He says his strongest point of growth was that by having a person that uses a character that he hates, a grappler, Abigail, on his team, he realized that his own personal effectiveness decreased. The next time they do this, he absolutely will not choose a command grappler for his team. Ayako asks Nemo if his team will dissolve now, and he responds "I'm absolutely firing Storm Kubo". Moke Flame pre-game interview. Ayako asks Moke what their team motivation is, since they have been eliminated from the Finals. Moke says that in the individual match he is in a competition with Mago. So he wants to show him how good he can do. He challenges Mago to a battle. Ayako asks Dogura about what he is feeling, since he is 3-3 in wins and losses. Dogura says that since Moke is so fired up, he's getting into it to. He said he was trying to keep a straight face, and actually since he can't often make Moke laugh he thinks things are getting interesting. Haitani says that he wants to support Moke and not let him down in this final battle. Tokido Flame pre-game interview. Ayako says that in the previous session Tokido said he would treat everyone to Yakiniku if they won, but then later on they say that they had ramen. He says they will go out as a team again. Ayako says that his teammates don't look too excited for ramen though, and moves on to Fuudo. Fuudo says it is a team tournament, and if that is what the leader wants, that is what they will do. He will ask for a larger portion though. He's also interested in the Mago vs. Moke battle, and he also wants to improve his win ratio. Mago says he was surprised that Moke is so fired up to fight against him. He says it is the first time he's seen Moke so serious. He's happy that Moke is taking it so seriously, and of course he can't run away from the challenge. Right after Mago's last match with Moke (wow, four in a row, that war pretty much planned) he let out a nice shout of victory. Moke Sunrise post game interview. Moke said that Mago's movement was really good, and he just wasn't strong enough, then he yelled out his thanks to Mago-san. He said he wasn't able to show a new sunrise as his team name would suggest. Ayako says that it seemed like they went downhill a bit in the latter half, and just didn't have enough strength. He once again thanks Mago. Ayako moves on to Dogura. Dogura said that he also found Mago a lot and had a challenge there, but he was left behind by Fuudo in that battle. Ayako starts to bring up some stats about how Dogura really did poorly against Fuudo in the latter half, and he cuts her off saying, yeah, whatever (more or less). Then he starts to say that what he thought was interesting was after Moke's match, when Haitani was up, Moke turns to him and says "Dogura, that was the most nervous I've been in my entire life" and Dogura is like "What, really!?" Ayako asks if Moke was just trying to pump up the team, but Dogura says he thought Moke was trying to do one of those "try to make the other guy laugh" games, but Dogura said that since Moke made Top 8 in EVO last year he thought he would be used to the pressure, but it really seems like this was important to him. Ayako then moves on to Haitani. Ayako asks how he feels since he lost to Tokido in this. He said, it's ok. Haitani is pretty taciturn. He's a bit sad that he lost in his matches. Ayako says she thought he started to enjoy the team battle more, but did he? He just says "yeah". She asked if he would like to join another team tournament, and he says "sure". He is playing it really straight and flat, and certainly doesn't sound like he was having fun. Quite a contrast from the sunny Moke, and ever-entertaining Dogura. Dogura also makes some great faces during Haitani's interview. Tokido Flame post-game interview. Tokido says that Mago did well. Ayako says that even though people were expecting a lot from the Tokido Flame team, they didn't do well. He says it really is important to build up teamwork. Ayako asks if it was fun, and he says, yes they had a lot of fun, and it is too bad they couldn't make it to the finals, but he's looking forward to watching the finals. He says he isn't done yet, and looks forward to the next time. Ayako says that Fuudo was able to win a lot against Dogura, how does he feel? Fuudo says that since he was chosen in the first round by Tokido, he feels like a lot was expected of him. Unfortunately, he was 4th from the bottle in win rate, and he feels like he let down his teammates, but it was still a lot of fun. Ayako thanks Mago for making things exciting even down to the end. Mago says that he wasn't trying to make thing exciting at all, but the battle between him and Moke was really great and he's happy that he won, and is thankful to Moke. Mago plans to keep trying to get results in SFV. He also says he had great teammates, and is sorry for dragging down Fuudo and Tokido (who make great gestures and try to play that down). Interview with Umehara Gold. Ayako congratulates Daigo on his win and asks how he feels. He says he feels a bit bad physically, but he thinks his team is ok. Ayako asks Sako how he is doing, and says that the other team probably has prepared for him. Sako says he prepared too, but there is someone that he isn't very strong against on the other team. Bon-chan says that they would like to keep their first place positioning. Interview with Fujimura Emerald. Fujimura says they are out to get revenge, and Ayako asks if Fujimura wants to meet up with Daigo and he's like "no, not at all!" Momochi says that he lost to Sako before, and he does want to get revenge and face off with him. Ayako says that they need to get to +7 to take over first place, and Momochi corrects her that it is actually +3. He says as a team they have a plan to get more than +3. Ayako moves over to MOV and thanks him for the interview they just did previously. She says he is sweating a bit, and MOV says since it is the last battle after two months, he really wants to go all out. Ayako says MOV's Chun really moves well, and he thanks her for that. Post-game interview with Umehara Gold. Ayako says that their team had been in first place almost the entire time, but fell down into second place, and wants to know Daigo's feelings about that. He says, well, I guess we just started out too fast. He thought there was always the possibility that they could lose, but didn't think that they would lose by enough points to lose the lead. Ayako asks what he thinks about the playoffs, and Daigo says that he thinks their team has the advantage over the characters on Itazan Ocean's team, so he thinks they can win it all. Ayako moves over to Sako, and says that while he wanted to meet up with Momochi and did in the last set, he lost. Sako says that Momochi was strong. He says that everyone is playing completely differently from when this RAGE tournament started, and he's a bit surprised by how much people adapted. He plans to practice for the grand finals. Ayako asks Bon-chan how he feels after falling down to second place. Bon-chan lost and feels bad about it, he says it didn't feel as bad when he lost in two matches the other time it happened, but this was for higher stakes. Post-game Fujimura Emerald interview. Fujimura says that since they had to win by a large point margin, he's really grateful to his teammates. Ayako asked Fujimura about his confidence level, and he said there was a lot of pressure, and this is the most joy he's felt at winning. Ayako asks about Momochi's match with Sako, who he said he wanted to play, and then he was able to beat him in the last set when they met. Momochi says that he has run into Sako a lot at tournaments this year, but hadn't beat him once, so he's really happy to have pulled out the win here. Ayako says that they might meet again in the grand finals, and asks how confident he is. He says that the loser usually does a better job at preparing, but he's going to work hard to make sure that he can win again. Ayako says that he didn't look good in that first set, but after that the momentum changed when he won his second set, and he looked really confident. MOV said that he popped off in that win (took a "guts pose") and he says that when they first met Umehara Gold at the start and went down by eight points, and he thought they didn't prepare enough for that. He's really happy that he has been able to play in this all-star league and really wants to win. Ayako asks him to do his best in the grand final. Results after the tenth section. After the results, they present who will be in the Korea vs. Japan Exhibition. The Korea team consists of Infiltration, Poongko, and NL. The Japan team was voted in, and will consist of (in reverse order of votes) Fujimura, Sako, and Daigo. Review of the second half of the tournament. They started the show out with a review of the standings, and talked about different players on the teams, along with win rates. They listed up the top players in terms of win rates (Daigo, MOV, Tokido) and talked about them for a bit. They also talked about people with the best anti-air rates. Daigo (48%), Haitani (45%), Mago (43%), Machabo (40%), Bon-chan (38%). We've got some Elias stats going on here - those are further broken down into land-to-air and air-to-air. I liked Hameko's discussion about how Nash doesn't have great anti-air options, but Bon-chan makes it work with air-to-airs. They have a discussion about throw breaking. Storm Kubo (41%), Momochi (34%), Dogura (31%), Fuudo (30%), and Sako (28%). The next segment is Hameko doing some analysis on interesting highlights from sections 6-10. He first explained why Mago dropped a combo against MOV that would have won him the match. I'm not going to try to explain the whole thing, but it is similar to some of the analysis you see on ELeague or GFinity. Next up was a clip of Kazunoko's Cammy defending against Tokido's Akuma, and why Kazunoko woke up with buttons. Hameko then talked about some of Fujimura's left-right mixups. The next segment was Hatta Ayako's selection of "memories". They have a bunch of shots of people cheering with funny pictures - you might have seen HiFightTH tweet about it - and then talked about the trash talking game. Although in Japan, they were saying that it is more about positive things than trash talking your opponent. Then they had a bit about Itazan checking his little blue notebook and the good results he got when he did. So they had a staff member ask him about his notes, and asked him to show it but he said it was secret and he would be too embarrassed to show it. Usually he takes notes on his phone, but during this All Star League they didn't allow phones on set (no tweeting?) so he had to change to a notebook for RAGE. They were making a lot of jokes about Death Note. They had a nice intro of the Korean players - Infiltration brought a Korean flag - and each player had a nice intro slide. Daigo brought out the Japan flag, so I guess they had that planned from the production side. They ran an interview with the three Korean players via an interpreter. Infiltration said that in Korea fighting games are not very popular, and these team battles are a very interesting, new flavor of event, and he wants to show good play for everyone. Ayako asked Poongko if the three of them practiced together, and he said that they did, and in fact that they have good teamwork. They will often practice before other large events as well. Ayako asked NL if he had taken any particular preparation or strategy for the Japan team. He said that he has recently lost to both Fujimura and Daigo, and has watched videos of Sako since he hasn't played with him before. Ayako asked if there is anyone he wants to play against, and he said Fujimura since he recently lost to him. Ayako then interviews Daigo, and said that Daigo was warming up (exercise) during the Korean team interview and asked if he's all warmed up. He says yes. Ayako says that the rules changed (winner stays on) and asked Daigo about that. He said those are easier rules for them so it is good. Ayako asked Sako if he is relaxed because he was already on a team with Daigo, and he says that things are a bit different without Bon-chan's cheering, but they've got good players. Ayako asked what he thought about the Korean players, if he has played them. Sako says that they are usually in CPT, so he's used to them. Ayako asks Fujimura about what it is like being on Daigo's team, and how is their teamwork? Fujimura says they practiced some. She also asks about whether he'll be able to take on Bon-chan's trash-talk (or team support) role, and he's a bit surprised, and wonders if that is what people are expecting of him. He'll do his best through his play. Ayako explains that the winner winning team will receive ~ $1000 of gift certificates to the Jojoen Yakiniku restaurant, with a six month expiration, so that's some good eating there. Infiltration gets $1000 worth of gift certificates for Yakiniku. That is a big pile of 1000yen tickets. Interview with the Korean team. Ayako says that Infiltration didn't get much playing time, but asks if it was good practice for EVO. He said that he personally was a bit dissatisfied (because he didn't play much) but his teammates played very well, and he is thankful for that. He feels like playing against this high level competition is good practice for EVO. Ayako asks Poongko how he felt about the matches. He answers in Japanese, and says that Sako was tough, but he was preared for Daigo and Fujimura. He feels very nervous, and is quite happy. Ayako was surprised that Poongko can speak Japanese, and he says that he wants to keep studying to get better at Japanese. Ayako says that NL had a good win rate, but went 2-2 against Fujimura, then asks about his feelings on the matches. He thanks them for inviting him to this event, and even though he went 2-2 he would like the opportunity to fight these strong players again. Ayako asks if they are going to use the Yakiniku gift cards tonight, and Poongko replies he doesn't know if they will have time tonight, but if they have some time tomorrow they will. Interview with the Japanese team. Ayako asks Daigo about how he feels. He said that he felt that this was a kind of sub-event to RAGE, and wasn't too excited about it, but once it started he really wanted to win, and feels bad about the loss now. Ayako says that she was worried when they went down 2-0 by sets, and Daigo said that Fujimura really changed the pace, and he's grateful for that because they were able to pull it back. Ayako asks if Daigo has any thoughts about Fujimura's play and what it will mean for the Grand Finals. He says that certainly Fujimura is a strong opponent. Ayako asks Sako about the Menat mirror match. He says it is tough, and he doesn't have a player to practice with so it is a lot of theory fighting, and it was a good match. Ayako said that she couldn't tell what was going to happen when they both (activated v-trigger? not sure?) she couldn't tell whose balls were whose, and Sako said he didn't know what was going to happen either. Ayako said Fujimura played very well. Fujimura said he feels bad about that last match. He said he practiced a lot with Mago and wanted to take it (He has Mago too?) he's glad they brought it back to 2-2, but feels bad that he couldn't win it. Ayako asked about teamwork, and Fujimura was like "yeah, we didn't really have teamwork" but they play together a bunch, so… Lots of laughs all around. So that was the Korea vs. Japan match. Pretty good! I thought Japan was in trouble after those first two sets, but they pulled it back and put up a good fight. Interview with Itazan Ocean. Itazan says he can't believe that grand finals are here already, there were all sorts of players at RAGE, like guys wearing headbands and people that are paid on commission (somehow he's poking fun at Nemo in both of these cases.) But these are the three teams that made it out. The MC says that Itazan's team really rose up in the second half of the tournament, and Itazan says that they won five in a row, and he thinks that they have the strongest momentum going into this grand finals. (He actually said they are the team with the most fat, which is a good thing for meat and sushi, and apparently is an expression for being able to do well due to momentum). Interview with Umehara Gold. Ayako asks Daigo how he feels even though he lost to Fujimura. Daigo says it doesn't really bug him. In the end, if they can win here that's all they need to do. Ayako says that now he has to beat two teams to win, and how confident is he. He says, yeah, I guess we're confident. The MC asks whether it's actually a better position to try to win from second place, and Daigo says that they lost from an advantageous position when they were up before, so maybe now the pressure is off a bit. Now the only thing they can do is go up, so there isn't as much pressure. Interview with Fujimura Emerald. Ayako congratulates on Fujimura on their come from behind victory. He says that their team made it to the top from the toughest circumstances, and really wants to win. Even though they don't know which team they will play, they are convinced that they can do well against either team. The MC asks whether he feels the pressure of winning between $60,000 and $30,000, and Fujimura admits that that weighs on him a bit. Ayako brought up the yakiniku thing again - where they will go out to nice Yakiniku if they win - and they get a laugh out of that. The change to have the winner stay on really is interesting. I think you have to act more as a team, thinking about which players can block other players on the opposing team. Gachi-kun didn't even get to play until the third match in the third set! So from a variety point of view, of seeing all the players, there is a downside, but when the team levels are close that added layer of strategy really appeals to me. At the FCA random 3-3 team battles, I'm often on a team where I'm the worst player by far, but it is still fun for me because we play with EX bar carryover and grey health life recovery based on time, so my goal can be something like, play strong defense so that a much better player takes all 80 seconds or something to beat such that the player doesn't regain much life. Team Battle Mode in SFV is really fun, and can be set up in many interesting ways. I'm glad RAGE has taken this opportunity to explore different modes. These Itazan - Daigo matches are just classic. Itazan Ocean post-game interview. I missed this section when I was taking notes live, so I'm going back to watch from the archives. The video is glitching on me, unfortunately, and I didn't get anything from Itazan's portion. There was some initial banter with Itazan about how he won from third place, then the video hangs. A commentor in the stream said that "I can't believe Ocean won, Ayako even won a Gold dress for Umehara Gold!" Ayako asks Machabo if he feels a feeling of accomplishment for winning, and he says that when he loses the life lead, he really starts to panic, but this time (the video freaks out again). The MC asks Machabo about his run in the second set, and he says that he felt like his strategy was right, and they might be able to take this. Ayako says that Gachi-kun didn't get a chance to play at first, but after that he got to play and did well. Gachi-kun says that since the team won, he's happy about that, but he's sad that "the anaconda" didn't get a chance to contribute (he started calling himself? the anaconda). Ayako says "Did you start calling yourself the anaconda?" He says that he thinks it is a kind of cute thing (people laugh - Machabo is really losing it - the comments are going on about how it isn't cute, and you're calling yourself that? and so on). He says he'll show them the power of the anaconda in the next set. The MC asks Gachi-kun if he's actually on the other hand a bit happy that Itazan got the OCV, and he says yeah. Ayako asks Sako-san what he think of today's match. He says their neutral game was bad, and it just didn't get better. He says he felt like he never was able to turn on that switch inside himself, and has to reflect on that. Ayako says that over the two months she's really thought that Sako's Menat really played well, and that he will have gotten more fans of his Menat and himself, and wants to know what his motivation and goals are now. He says that at EVO he wants to show how strong Menat can be. Ayako says that Bon-chan showed some great play, and even better cheering over these two months, and asks for his review. He says that he had a lot of fun, and laughed a lot while watching the games, and he hasn't had an event where he could laugh so much while enjoying it. He's sad that it is ending. Ayako asks if it is because you have teammates and can share their joy, or because there are people that do funny things. Bon-chan says that in the individual matches it is on you, and it is nice to have a team. Also, having team leaders really gives some special qualities to the team, and you don't want to let the leader down. He says that their leader was able to bring (carry) them this far, and he feels like he wasn't strong enough, and has to reflect on that. The MC asks if being able to see things while on Daigo's team was something that can help him in the future. He says that he's worked with these players for a long time, but being on the same team has been good. By the way, my translations are not that great, being an interpreter is tough. Itazan Ocean pre-game interview. Ayako asks Itazan about what he thinks about winner stays on rule. He says that it changes things from the star getting rules, and he thinks it changes the dynamic of how you get points. Ayako says that if someone gets on a roll they can beat all three people, so the order is important. Itazan says that is really important, and they think very hard about who to put up first. Momentum is important. Itazan also says that they are warmed up and in a good position. Ayako asks Machabo about how he is feeling from a physical point of view. He says he is used to these winner stays on team tournaments, and is in good spirits. They ask him how can he concentrate and what does he think about, and he says he doesn't think at all, just concentrates and plays as normal. Gachi-kun wants to win. Ayako asks him about the determination of the "anaconda". He said that took the fangs out earlier (?) and wants to really chomp down on the competition and win. The camera cuts to Fujimura Emerald, who look a bit bemused. The MC says that this is the first they've heard about the Anaconda, and they are having trouble getting used to it, but it will be very charming to see a Happy Anaconda. Fujimura Emerald pre-game interview. Fujimura says that he expected Umehara Gold to win. He brings out his notes that were all for Umehara Gold, and said he had to re-write them on the back for Itabashi Ocean. He think they had the advantage over Itazan Ocean though, and that it will be easy for them, they have a good win rate over those guys. The MC says that being so confident must be an advantage, and Fujimura agrees, and says they can take this thing! Ayako says she talked with him a little earlier about his streamed session, and how it was just Guiles all the time. Momochi yesterday had a session with his team to practice. He asked for people to join the lounge with characters from Umehara Gold and Itazan Ocean, but about 80% of the people that came in were Guile. Ayako looks back to Itazan ocean, and the camera pans over to show them all trying to keep a straight face. Momochi also said there were a bunch of Karins. The MC asks Momochi if he sees a hole in the opposing team. He says that the others are very motivated, particularly Itazan, and that they came up from the bottom, and are looking strong because of that so he doesn't really see many weaknesses. Ayako asks MOV if he thinks, because of the rule change, that there is anything that he needs to change. MOV says that the winner stays on format can be a bit intimidating. He has a lot of confidence in his team leader who is confident. Ayako says that while he sounds a bit un-confident, when he really wants to win and concentrates he looks very manly. He says that he plays with the intention to send his opponent to hell. She asks specifically who he wants to send to hell, and MOV says he isn't good against any of the other players, so he'll just do his best. The MC asks if he does anything to put his game face on, and he says that he warmed up a bit - then Ayako says that he always does five minutes of exercise before the match. MOV says that this match is important in his fighting game history. Momochi Akuma in the first set was a surprise. Went back to Kolin in the second set which makes more sense. Momochi Akuma shows up again in the 4th set again. Itazan Ocean takes it! Ayako asks Itabashi about Momochi using Akuma. He was surprised that Akuma came out instead of Kolin or Cody, but he was happy about that because he thought it was to his benefit. He was asked about how they were able to come together as a team, and Itazan credits the team concept of being the Kinki (an area of Japan) team. The cheering from the team was really good when he was doing Abigail punches. Ayako asks if Machabo grew or improved over this time. He thinks he wasn't as good as the others, but he was able to grow a bit from all the matches. Machabo just turned 30 so she congratulates him on that, and asks about his future plans. He is aiming to win some competitions in SFV and plans to go to more tournaments. Ayako asks Gachi-kun about how his aggressive play started to come out later in the series. He says that if you just play super fundamental people will read you here, and you have to throw some wild stuff in there. I really enjoyed this tournament series. The matches were great, but for me the most fun was seeing the team interplay. I thought the production was really good, they had nice camera angles, and took great reaction shots of the players and teammates. You could really get a sense of the personalities of the players. I always looked forward to the interviews, and even though my translations aren't great, I hope you were able to get some of the flavor of that interaction. Some of the players were always consistently very fun in the interviews. Dogura, Bon-chan, Itazan, Nemo, MOV, and Storm Kubo were always doing something funny or interesting. That isn't to say the other players didn't give good or interesting interviews, for example Haitani played a role – or maybe just naturally is – of the straight man on the team to Dogura's crazy antics. Sako similarly balanced Bon-chan, ever energetic. Daigo is super laid-back, and almost funny at how it seems that he isn't playing along. I really enjoyed hearing everyone's perspective. The teams themselves each had a bit of personality, particularly Nemo's Aurora team. Please see the Sentimental Typhoon's tweet thread about the Nemo Black team, which does a great job to explain that dynamic. Nemo played the heel role here, and generally has been doing that in the Japanese FGC, but not in a way that insults others or disrespects them. The rivalry between Nemo and Itazan is a lot of fun, and not in a way that I worry about whether those two are going to go out back and punch each other for real. The team format using SFV's Team Battle mode was very interesting. I like that they experimented with two different styles, the one used in the tournament to settle seeding (first team to win two of three matches gets a star, first team to three stars wins, players only play one game in a set) and the Japan vs. Korea and Grand Final matches (winner stays on, first team to eliminate all other players wins the set). There is a bit more strategy in the team battle when you have to think about character and player matchups. I thought it was fun to watch. I also like that they thought about how to create incentives such that each game was important, even if the set winner had already been decided, but using game differential as a tie-breaker. With the first set of rules we were sure to see many different matchups, and got a lot of exciting games in the process. On the other hand, OCV (one character victories - it took a long time before I actually knew what that OCV stood for - and I still might be wrong) are exciting too. I hope to see another run of the All Star League Powered by Capcom. I think it worked really well in Japan because there is a concentration of strong players, and the one-off Japan vs. Korea match was nice. It would be great to get a US All Star team, or see a larger tournament with representatives from more countries. From an economics and time point of view, that might be really hard to work out. It is also pretty amazing if you looked at the schedules of the Japanese players over the two months of this run - many of them would play in the RAGE league, fly out the next day for an international flight to a tournament, and play less than 24 hours later in another country. That is crazy. I hope you enjoyed my summaries, and please support the FGC however you can. If you want to watch the videos of these matches, try using OpenRec for a month's membership to get the archives, it's like $5. That can help by letting them know that people out there are willing to pay for good content. An income of about 3.4 billion USD in 2017, with a profit of 280 million USD or so. Thanks to toph for correcting me on 立ち回り (neutral game) a long time back. I feel like this interview epitomizes how Daigo doesn't play along with the TV show aspect of things. He answers questions directly (we weren't playing a good neutral game) and when the MC sets him up for an easy question on the storyline (did you feel the pressure from Itazan Ocean coming from behind to win) he just answers basically "no, that's not it, we just weren't playing with that urgency of the chasing team". The guy just says what he means, and often answers on a much more abstract level than the actual question. Thank you very much for this write-up, DocFugu. And all your other awesome FGC translations and write-ups as well of course! Thanks for continuing to translate the post-match interviews. Always interesting to read what the players has to say. Even with the English commentary being a thing now, these continue to be very educational and helpful. Thank you. Thanks, I corrected the misspelling here, and in other articles. Are you going to translate the post-game interviews of the Umehara vs Itazan match? Sorry, I had forgotten that. I just updated with that portion.